I got stalled on my first review and decided to start over. By that time, Aaro had begun his review of the OVAs + Hitotose 01. He’s doing a fairly comprehensive plot summary of the series (It’s pretty hard not to be comprehensive with such a simple plot.) so I’ll try something different to minimize redundancy. I’ll edit this post to provide a link to Aaro’s once his review is published. 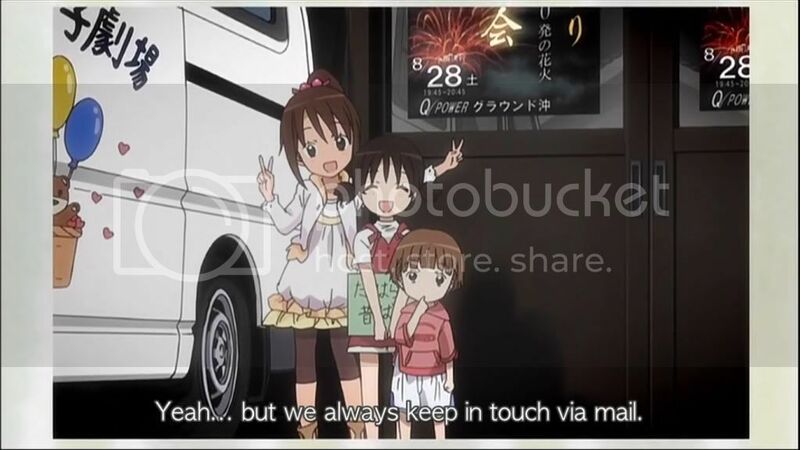 Since Tamayura is a well-paced slice of life, it focuses heavily on the characters’ development and their respective personal growths. So, to track this growth, it is important to well establish the ground zero. Character introductions anyone? The protagonist of the story, a ninth grader, an older sister, a daughter and a best friend – Fu is many things on a day-to-day basis. One thing she misses being is her daddy’s little girl. Fu’s father recently passed away and the loss has felt a void in her life. Albeit she’s at an age where she should be growing, exploring and self-discovering, her life is now stagnant because she doesn’t know how to move past this tragedy. She spends her days aloof and glum, not knowing what’s wrong or what she can do about it. All she really understands is that she hurts every time something comes along that reminds her of her father. 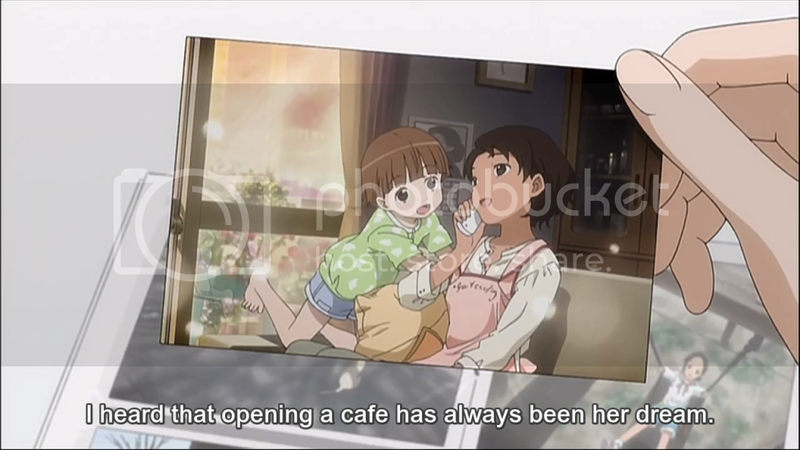 As the episode progresses, Fu is pulled out of her sad bubble by photography. The camera lens makes the world a better place for her and helps her make peace with the fact that her beloved father is now gone; but she can keep a piece of him with her in the form of her talent for photography, which was largely gifted to her by him. Once she embraces photography she morphs into a happy, vivacious girl with a curiosity for the world she knows nothing of. By the end of the episode, she is the girl we meet at the beginning of the OVAs. Fu’s metamorphosis is handled expertly; it is neither too fast nor too slow. Although, in comparison to the OVAs less is left to inference on behalf of the viewers, the growth is not slow, boring and spoon-fed. Chihiro is Fu’s best friend and a crybaby. Initially, I found her very annoying. I’ve never really dealt with people who articulate every emotion with tears. Objectively, there is nothing wrong with her character and I’m certain people who cry at the drop of a hat exist somewhere. I just find the quality very annoying. Chihiro is a good friend to Fu and is hyperaware of everything that could serve as a remainder of her father. She is easily flustered but tries her best to shelter Fu from every little auxiliary pain. In the end I think while her intentions were good, her obsessive sheltering was hindering Fu from dealing with her grief by encouraging avoidance. It's not crying if you don't see the tears! Over time, Chihiro draws strength from Fu’s growth. She becomes stronger and makes a conscious effort to diversify her reactions to the world. (After all, crying isn’t the only way to communicate.) Her hobby seems to be sewing and she makes Fu a plethora of dolls for good fortune. She also stiches her a cute camera case with a slot for a lucky charm given to Fu by her photography idol. I don’t think Kou is important enough to warrant his own section, but he’s so damn cute that I feel like indulging myself with enough space to squeal. Kou is Fu’s younger brother. I’m unsure of exact age, but he acts like a four to six year old child at most. His mannerisms are cute enough to make him younger but he is animated as a child not a toddler. Kou is very attached to his sister. Judging from his father’s photographs, his sister and he were always together after he was born, justifying his attachment to her. He is largely the reason Fu was pushed back into motion after her father’s death. One day, he’d found his father’s photo album and was happily flipping through it, reflecting on the memories happily, for that is what they were. Seeing him, Fu realizes that she does not need to erase every reminder of her father from her life. Instead, she should embrace his greatest legacy and solidify his presence in her life forever. Although Kou is too young to realize the impact of his actions, he is an integral part of Fu’s metamorphosis and her support system. Now a single parent, she tried in her small ways to help her children deal with the recent tragedy. She is a mild mannered, supportive parent and has a dream to own and operate a café someday. She is Fu’s childhood friend from Takehara. She has a cameo in the first episode, but I know from the OVAs that she is part of the main cast. She will be properly introduced in later episodes. The recent passing of Fu’s father is implicit to the plot. 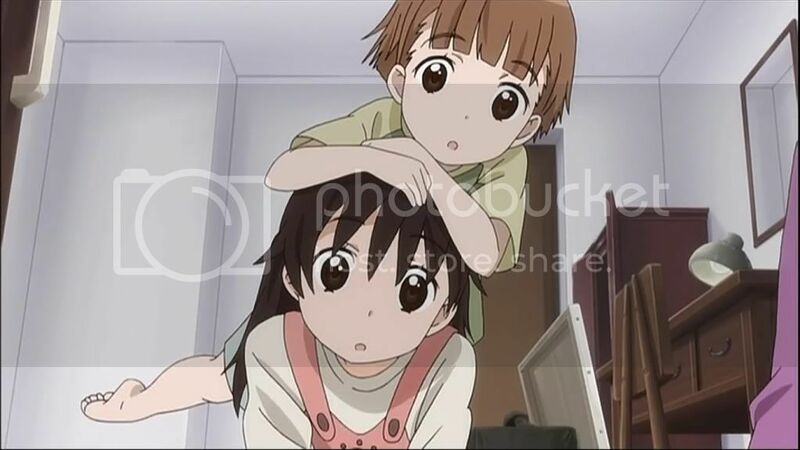 Hitotose begins with the friendship between Fu and Chihiro, and it is a sweet age-appropriate friendship. I liked the realism with which the effect of the father’s death was portrayed. Personal experience has taught me that the grieving are often left to console those around them who have no idea how to respond to their tragic news. Similarly, Fu is constantly comforting Chihiro who bursts into tears at every small reminder of Fu’s father. Chihiro in turn is hyperaware of all these remainders and tries desperately and awkwardly to shield Fu from them. 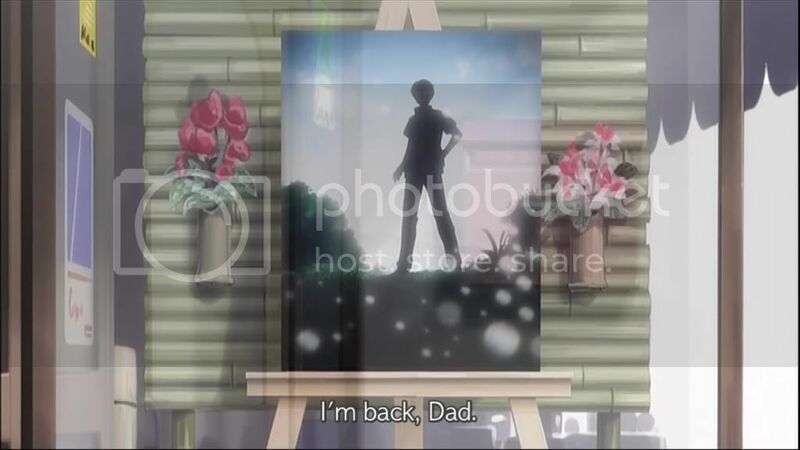 One day Fu comes home to Kou browsing her father’s photo album. 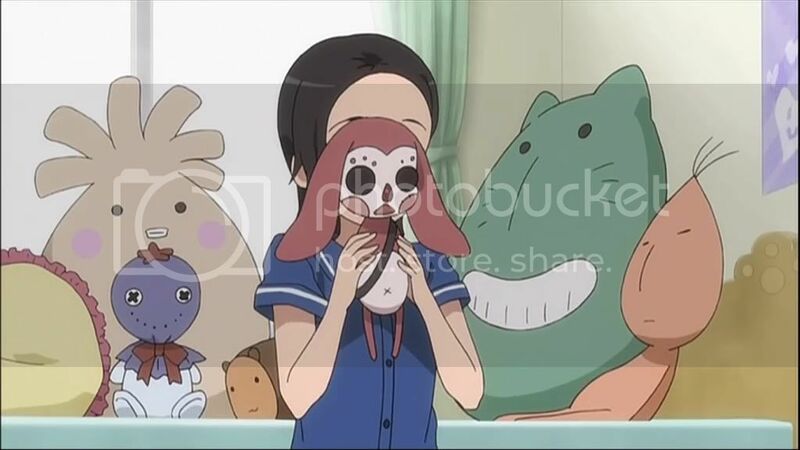 She is stunned that a memento that bring her so much sorrow can made her younger brother so happy and excited. After an evening of introspection, Fu decides to return to photography and asks her mother for her late father’s camera. After a few short days of photography, Fu’s spirits are high and she decides to attend high school in Takehara, her father’s hometown. This is a big leap for a girl who until recently was completely stagnant in her life because she neither wanted to life with her father’s death nor lose her memories of him. 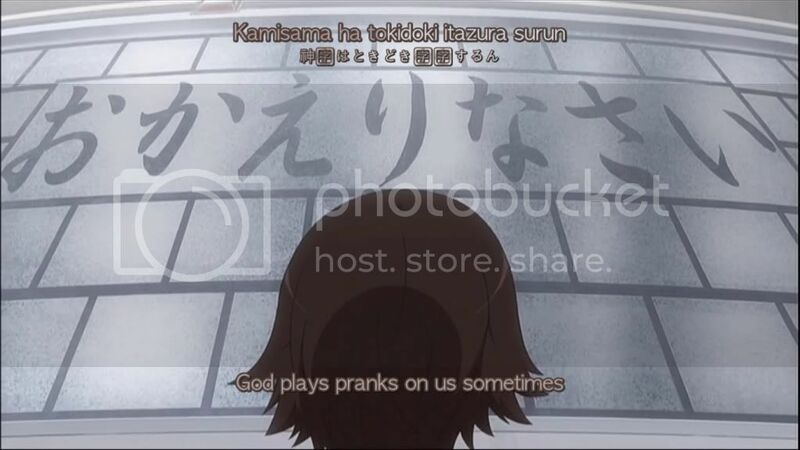 Kou insists that he wants to go along with his sister, and so the family decides to move their life to Takehara. Fu and Chihiro have a bittersweet parting. The latter has learned to be stronger and wishes Fu the best in Takehara with a handmade camera case. The case has a charm holder for Fu to store the no-destination train ticket from Shihomi Riho, who is Fu’s photography idol. Before Fu leaves for Takehara, she cuts her hair as a sure sign of her personal change. This is symbolic of Fu cutting off the grieving, gloomy parts of herself and proceeding into her new life with minimal emotional baggage. 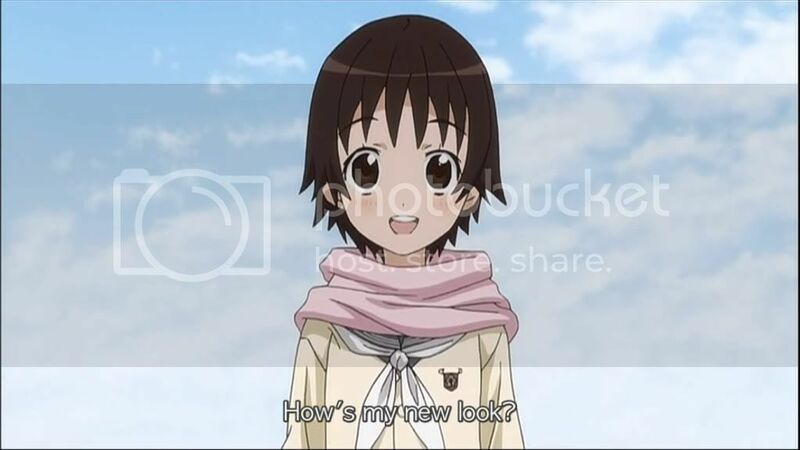 Chihiro approves the shorter style because it suits Fu’s changed personality much better than her long hair. 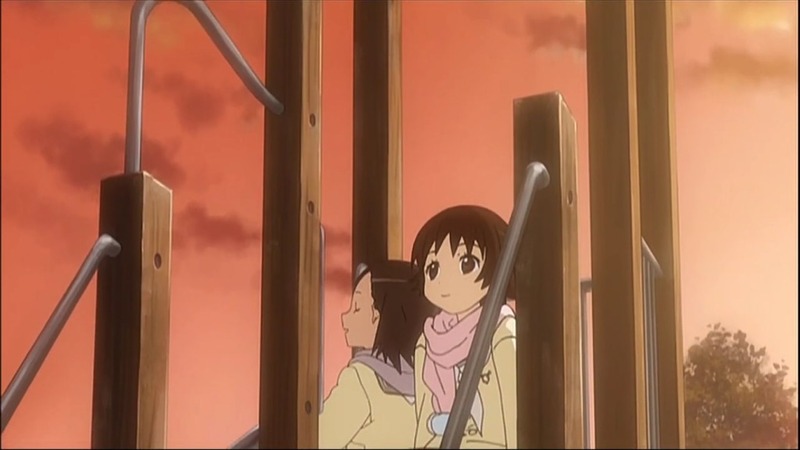 On the train ride to Takehara (which I really want to take – how picturesque) Fu happily reflects on a few memories of her father. This is another big step forward for Fu, who previously reminisced with melancholy. When she arrives in Takehara, she is greeted with the words “okaeri nasai” (welcome back) chalked into the platform. Kaoru is there to welcome her as she takes her first steps into Takehara and her new lifestyle. 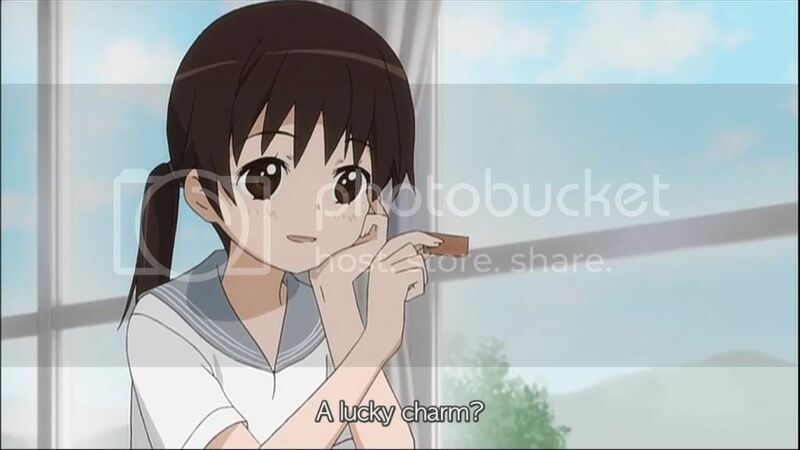 Hitotose 01 was a prequel to the OVA content. I refrained from constantly referencing the OVAs in this review. However, I recommend if you are picking up Hitotose, watch the OVAs. It’s a 50 minute commitment that is well worth the time. Moving forward I’m concerned that the first episode left off where the OVAs began. I would not like to see the OVAs rehashed and ruined in Hitotose. However, the staff has done a spectacular job with the series so far. I’m comfortable trusting them with high expectations.